Thai rescue team members walk inside a cave where 12 boys and their soccer coach have been trapped since June 23, in Mae Sai, Chiang Rai province, northern Thailand. Rescue teams worked quickly through now-familiar cavern passageways Tuesday in hopes of bringing out the last members of youth soccer team trapped in a rain-flooded cave. At least three more boys reached safety after diving and wading through channels of murky water, aided by expert divers, according to a rescue worker at the cave site. It raised hope and excitement that the remaining two — including the team’s 25-year-old coach — could soon follow. 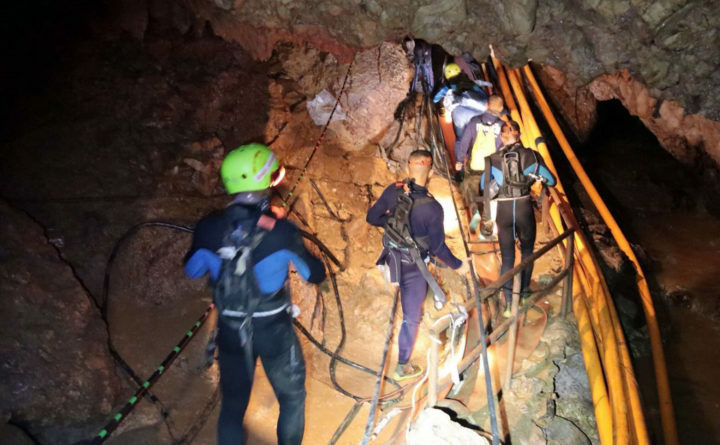 It was the third consecutive day of rescues during a break in the seasonal rains that have lashed northern Thailand and set off flash floods that left the 12 players and their coach stranded inside the caverns more than two weeks ago. Mission chief Narongsak Osatanakorn said he expected the team of 18 divers to be faster in their rescue efforts, as they grow more skilled and confident in an effort they earlier warned was fraught with risk. “I do expect all of them will come out today,” Narongsak said, as the press center erupted in cheers. Monday evening, he described the divers as “more confident” and able to work faster. Three Thai navy SEALs who have been with the boys since they were found and the doctor who has been assessing the boys will also be extracted Tuesday, Narongsak said. The boys and the coach were found more than a week after they became stuck on a small, muddy patch deep in the cave’s network of chambers. The world has been rooting for them since, especially after warnings from experts about how much could go wrong in the process of bringing out the young boys, who cannot swim and were weakened by their long ordeal. Their supporters have included world leaders, Facebook founder Mark Zuckerberg and billionaire inventor Elon Musk, who tasked his team of engineers to build a “kid-sized submarine” made out of rocket parts that will be able to move the young boys through the cave’s narrow passageways. On Monday night, Musk posted on Twitter that he had “just returned’ from the still-flooded cave, with photos of the rescue site where a team of swelling international experts have been working around the clock since the team was found. “Leaving here in case it may be useful in the future,” he wrote, referring to the “mini-sub” which he has named after the team, the Wild Boars. In an Instagram video, he posted his journey through the pitch-black flooded cave, lit only by a few torch-lights. Doctors attending to the eight boys who have been rescued from the cave in two groups of four on Sunday and Monday say they are generally in good health – an incredible result for the boys who have spent nine days incommunicado, without food, until they were found, and then waited days more before embarking on an hours-long dive that even the most skilled cave divers have described as among the most dangerous they have attempted. A retired Thai navy SEAL died Friday after he ran out of oxygen while placing compressed-air tanks along the exit route. “Doctors have treated the boys and now all of them are OK and cheerful, and are talking normally,” said Jesada Chokedamrongsuk, from the Thai Ministry of Public Health. One of the boys initially had a heartbeat that was too slow, and some had low white blood cell counts, but they have since been stabilized. Two have been treated for minor lung infections, doctors added. They were all treated for rabies, in case of bats in the cave, and tetanus, and set up with IV drips. None of them have fevers, and all are able to eat normal “medical” food, the doctor said, an improvement from the watered-down porridge they were fed when they were first rescued. A nutritionist is monitoring their diet and has recommended that they eat nothing spicy or salty — despite the boys’ cravings for spicy basil pork and rice, and grilled pork. By the evening, the boys were able to joke, laugh, and have normal conversation, doctors said. They are still quarantined away from their parents, who have been able to see them through a glass window but not touch or hug them. The boys, however, were visited Monday evening by Thai junta leader and Prime Minister Prayuth Chan-ocha, who was kept about two meters away from the boys.